Bar Bukowski is a new cafe and bar in Amsterdam East located on the corner of Oosterpark. The bars name refers to the American writer Henry Charles Bukowksi; the interiordesign of the bar is inspired by his life , taking reference from his love of women, literature and drinking. 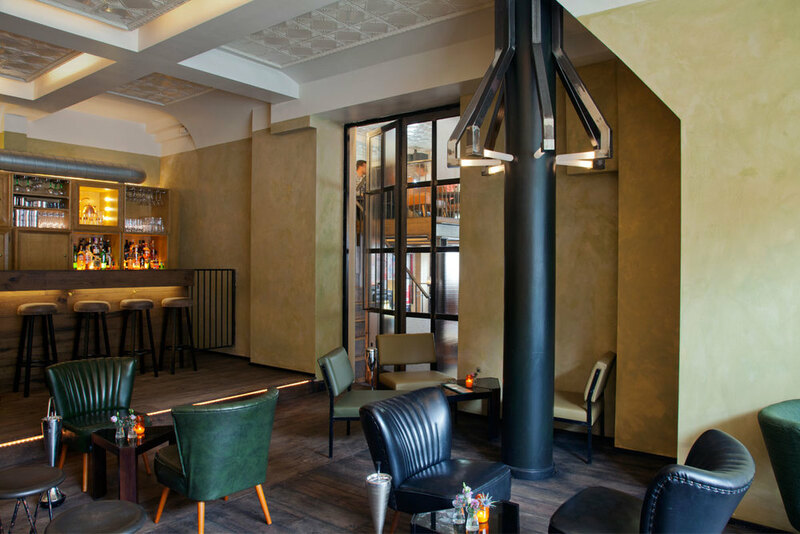 Studio Modijefsky has also designed an adjoining space called Henry’s Bar, which opens its doors on weekends and is an extension to Bar Bukowkski. Graphics, linear elements, bespoke doors, benches and stools and custom made railings along with the unique lighting elements have been used in the interior and create vertical and linear relations in the space. Central to the bar hangs a large custom made light fixture, portraying a typewriter. 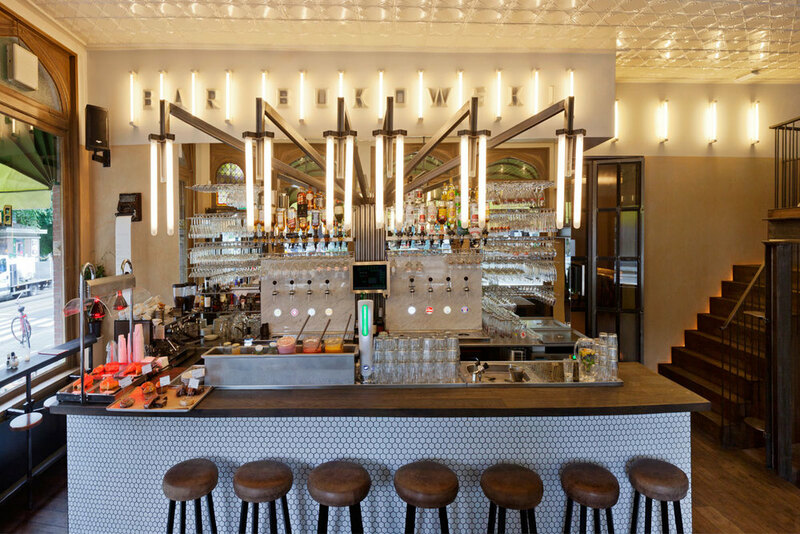 American materials, such as tin ceiling tiles and hexagon tiles on the bar,next to the bar name painted on the windows, are all subtle references of the identity of the writer. Henry’s Bar, awakens on Thursdays. The bar discloses a dark atmosphere with low seating, artist painted murals with quotes from the writer and a light fixture in the shape of a bottle. The custom bar cabinet, when opened, reveals an entire cocktail bar. 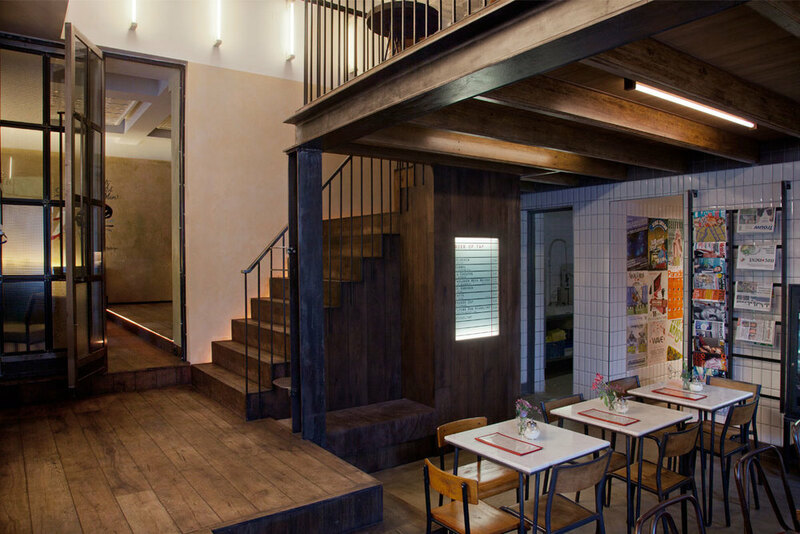 In addition to the interior design, Studio Modijefsky has also designed the logos, menu and website of Bar Bukowski.